A. What is your first and last name? B. What are your first and last names? The second version seems more grammatically correct than the first one, but it just sounds odd. The first one is what you'd typically hear in speech, but that of course doesn't mean it's right. So is one of these more right than the other, or are they equally valid? EDIT: Option A previously said "What are your first and last name" when it should have said "What is your first and last name". My question is about the pluralization of "name". B. What is your first and last names? C. What are your first and last name? D. What are your first and last names? Both are correct. As one man said, such is the beauteous efflorescence of the English language. With the rise of bureaucracies and the filling in of forms, we can imagine how "first and last name" came to be viewed as a collective noun. Since "what is" agrees with "first and last name" and "what are" agrees with "first and last names" your question is really just between name and names. "Which form is more commonly used by the people" is a question very different from "which is grammatically correct", although frequent and widespread use of a phrase, construction or idiom confers its own validity quite independent of grammatical correctness, which is determined by the formal "rules" of the language. That makes both forms equally valid from a descriptive perspective and you can use "name" or "names" without changing the meaning. Update: OP @AleksandrH has reported in a comment that a google search for each of the 2 sentences in question was done as recommended by @MaxB and "What is your first and last name?" has about 250k more hits. It is worth noting that Google Ngrams searches books while Google search actually records how many people used the exact phrase as found in all online sources. As for strict grammatical correctness, only "what are your first and last names" is correct because they are 2 names, which is plural (except when a person has just one name in total, which is considered a mononym and not usually categorized as "first and last name"), but the way people speak is often more common-sensical than grammatical! I agree with MaxB that "D" is grammatical (as ma8 points out, "D" is obviously correct if we are asking about multiple first and last names, for example in a question addressed to multiple people) and "B" is ungrammatical. 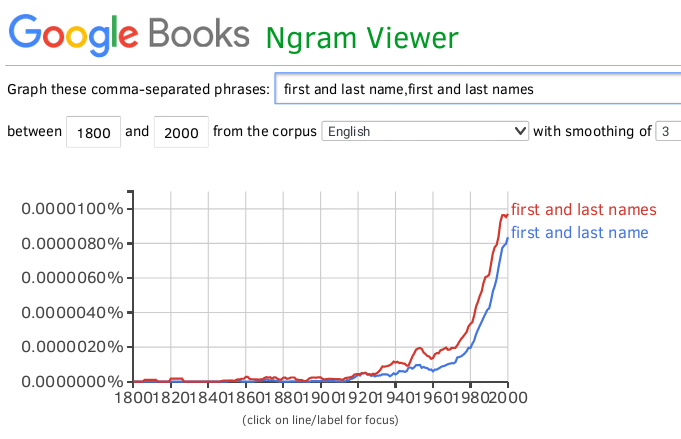 "your first and last name"
The Google Ngram Viewer indicates that in 2008, "his first and last name" was a bit more common than "his first and last names" (although they look close), "my first and last name" was more common than "my first and last names", and "her first and last name" was more common than "her first and last names". I disagree with MaxB's answer in that I don't think it's correct to characterize "C" as "ungrammatical". As MaxB points out, it can be interpreted "your first name and last name" with ellipsis of the first "name". score if a first and last name are mentioned, or if only a last name is mentioned, but not if only a first name is used. And of course you can find many examples online with a simple Google search. Note that people say things like "both my first and last name", which I think would have to take plural verb agreement. However, constructions like this do seem to be somewhat controversial, judging by the answers to the following question: "Both the first and the last [plural]" vs. "both the first and the last [singular]"
I don't agree with Hugh's answer because I think the frequencies of "is first and last" and "are first and last" are unlikely to be similar to the frequencies of "is your first and last name(s)" and "are your first and last name(s)". I'm not sure if I agree with MaxB's statement that "A is the right choice if you only need one full name", or Nick Uva's suggestion that "first and last name" can be interpreted as a "collective noun". The only sense in which I'm sure it would be grammatical for me is unlikely to be encountered in practice: "The name that you had from the start and that you will continue to have till the end" (as in the sentence "That was the first and last time my mother yelled at me"). I would be more inclined to interpret it as somehow being an elliptical version of a question like "What is your first name, and what is your last name?" Neither of these seems to have been edited very well, if at all, but I think that's irrelevant to the point I'm trying to make: that people do in fact sometimes use "What is X and Y" in situations where it seems unlikely to me that the coordinated noun phrases "X and Y" can be interpreted as referring to some single thing. That said, I guess it does seem possible that this is a situation where "your first [name] and last name" is treated as an "X and Y" coordination that takes singular agreement, as discussed in Singular verb after two noun phrases joined by "and" that can be thought of as a single thing. There is another, even more relevant question that I upvoted, but that unfortunately has no answer: "What is your name and height" or "What are your name and height"
Isn't A asking one person for her first and last name while D would be used when asking a group of people for each person's first and last name? For example, if a cop wanted the names of everyone in a group who was caught smoking, she would ask, "What are your first and last names?" But, if she was only interested in the teenager who had supplied the cigarettes, she would ask, "What is your first and last name?" All equally valid and grammatically correct. In spoken use as a previously posted Ngram shows spoken and written can vary. Who cares if you are in a suspect line-up. But if writing a corporate biggie, always best to strive for correct grammar. What is your name (first and last)? The question does not ask about nicknames or aliases, so there is no context for plurality. both work. although was often, first and family/christian name/s. again. the plural actually acts for the covering of MIDDLE name/s, if applicable. I find both grammatically incorrect, instead, you should ask "What is your first and last name?" I don't believe you'd ever hear someone say "What are your first and last name?" That seems wholly incorrect to me. B definitely seems more valid than A, though if possible, I'd stay away from using are. Is “our and other” correct? Which of “game names” and “games names” is correct? Is the sentence “how are the names of your dogs?” correct?